Your new book, The Mona Lisa Sacrifice (CZP, 2013), is a both a departure from your previous two books and also a return to home for you. That is, if one draws a line between so-called genre writing and literary fiction. I don't want to dwell on the genre question, but I do want to know if this latest book was more fun to write. Also, is it fair to say that your writing is both progressing into a new phase and also returning to base? Yeah, The Mona Lisa Sacrifice was a lot of fun to write. I enjoyed creating my first two books as well – I chuckled often while I was writing the hapless drifter in Please, and The Warhol Gang was just plain absurd – but they were books that focused more on situation and trends in our society. They were plot and issue driven rather than character driven. 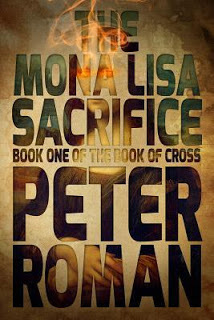 The Mona Lisa Sacrifice is a much more character-based book, and I love the characters of Cross and his friends so much. In fact, the concept for the entire series came to me with the character of Cross, the soul who occupies Christ’s body after Christ is crucified and dies. Once I had him figured out, and a sense of the kind of story I wanted to tell, the other fantastic characters just started drifting into my mind, and I had as much fun bringing them to life as I did with Cross. Judas was an early one, of course, and I decided to make him an ancient trickster god dedicated to the destruction of humanity rather than just a misguided mortal. Then I dreamed up Alice, who’s sort of an escapee from the Alice in Wonderland books and a very strange character who can move between libraries. The faerie queen Morgana was a lot of fun to write as well, especially given the power struggles that Cross and her have over the years. I decided at an early point to make everyone larger than life and really embrace the fantastic in this series – just wait until you see some of the characters in the second book! So it was really enjoyable to write these characters because I could let my imagination run wild in a way that I couldn't with my other books which, however you want to look at them, are essentially realism. I’m not sure I’d say my work is entering a new phase – I’m still writing literary fiction as well as the genre works. I’m midway through a new lit novel now, and I’m thinking about the next one. I’ve got some ideas for stories when I can find time – I’ve also written a story that’s sort of a sequel to Please, starring the same narrator. It needs one more write through, I think, but I just don’t have the time at the moment. Hopefully before the end of the year…. The Cross books and the other genre stuff I’ve been writing – the weird westerns that have been published in the online magazine Beneath Ceaseless Skies, for instance – have been more of an expansion of my writing than choosing a different path. I just wanted to write stories that were a little different than the literary fiction I’d been writing. But I always intended them to be in addition to my literary fiction rather than replacing it. I should note that I still consider my genre works literary. I work hard at the craft and still try to write an interesting sentence, and I blow up the genre conventions and constraints rather than confine myself to them. But they're definitely in the genre camp when it comes to marketing and all the practicalities of the publishing business. The Cross books do mark a return to base, as you say. People have asked me whether I was influenced by Neil Gaiman’s Sandman comics or the character of John Constantine in the Hellblazer comics, but in fact my influences go much farther back than that. I grew up reading and rereading Roger Zelazny’s Chronicles of Amber – that series was one of the things that started me writing. I always wanted to tell an epic tale like the Amber books, populated with strange and wondrous characters. When I came up with the character of Cross, I realized this was my opportunity to write my equivalent of the Amber books. So yeah, the writing thing has kind of come full circle for me. I mentioned to you earlier this year that I would ask you about Cervantes, that ancient anti-literary literary forbear. Don Quixote is a wandering fool (and the book a commentary on popular romance narratives) and your protagonist, Cross, is also a wanderer, seeking perhaps what can't be found as he surfs across some of the greatest disasters of human history: gory Rome, medieavel knighthood, the holocaust. There is obviously much magic and anti-realism in The Mona Lisa Sacrifice, but there is also among the destruction important points about hope and quest for meaning. As Don Quixote is a book about books, is The Mona Lisa Sacrifice a kind of story about stories? Absolutely. I had a choice once I came up with this immortal character who’s lived for thousands of years and basically all of civilized history: he could be the sort of guy who just drifts through history anonymously, always in the background, living through unimportant events, or he could be the sort of guy who is right there in the middle of everything, present at every important event. The whole fight with the angel in Gaudi’s Barcelona church at the beginning of the book is all about this. I wanted people to think, “I know this. I have lived this.” It just makes the story that much more personal and brings readers' own stories into the book. At the same time, I really did want to write, as you say, a story about stories. There are many asides in The Mona Lisa Sacrifice where I mention events/characters that could be books on their own, and then never follow up on them. Take, for example, Cross’s comment about the time he stole the U.S. constitution because he needed it for a certain ritual. I didn’t follow up on that story elsewhere in the book, and I don’t intend to in the other books. I really like the idea of readers creating this other, parallel story in their own minds, based on the little asides that Cross makes here and there. I’ve always liked books about other books and tales that address storytelling itself. Certainly there was more than a bit of Eco, Calvino and Borges in the back of my mind while I was writing The Mona Lisa Sacrifice. I think one of my early pitches on the series was it's Roger Zelazny meets Umberto Eco. As for Don Quixote, that wasn’t in my mind when writing the book, but it’s not a bad comparison. Cross certainly has his moments of being a wandering fool, especially in the flashbacks, which are set over different ages, and he’s often on the wrong side of history. But at heart he means well and is generally trying to do the right thing, even if he makes a mess of it. Which is almost always. I'm going to ask you to pick a director and a dream cast of stars, if you were to see one of your books (or stories) made into a major motion picture. What work would you pick? Who would you choose to direct and star in it? Also, briefly, why. Before Robert Downey Jr. played Iron Man, I could have seen him in either Please or The Warhol Gang. He used to have that sort of lost, adrift personality – psychically, morally, spiritually, you name it. But I think he’ll forever be known as Iron Man now, just like Johnny Depp will always be Captain Jack Sparrow. So I guess I’d have to take Aaron Paul (Jesse on Breaking Bad). Whatever happens, I think the episode in Please where they run over John Cusack with a car really needs to star John Cusack. As for The Mona Lisa Sacrifice, well, it would be kind of fun to see Iron Man beating up angels. Or maybe Jason Statham. Anyone who can guarantee funding for a film, basically. Hell, if Seth Rogen wanted to star in it I'd give him my endorsement. I've always pictured Jesus as Seth Rogen! Best piece of parenting advice you ever received? It’s best to think of kids as little mad scientists – they’re always experimenting with their world, trying to understand how it works and blowing it up because they don’t know any of the rules. Thinking of them like this is the only way to forgive them for ruining your life. What would you like to ask J.D. Salinger? What did you do with the Rob Ford crack video? What's your favourite opening sentence from a short story? "I was an infinitely hot and dense dot." From Mark Leyner’s My Cousin My Gastroenterologist. After that, there's nothing left to say.